Here is the revised edition of Charles Dawrin's The Origin of Species, introduced and abridged by Philip Appleman, published by W. W. Norton. 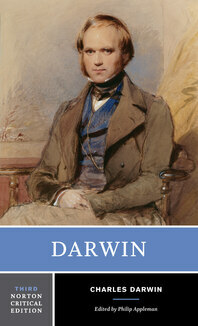 "The best Darwin anthology on the market" (Stephen Jay Gould, Harvard) has just become better, in this newly revised version of the now classic Norton Critical Edition, first published in 1970. The impact of Charles Darwin’s work on Western civilization has been broad and deep. As much as anyone in the modern era, he changed human thought, and his influence is still felt in virtually all aspects of our lives. This new edition, larger and more varied than the previous ones, includes more of Darwin's own work and also presents the most recent research and scholarship on all aspects of Darwin’s legacy. The biological sciences, as well as social thought, philosophy, ethics, religion, and literature, have all been shaped and reshaped by evolutionary concepts. Excerpts from the most important books and articles of recent years confirm this Darwinian heritage. New work by Richard Dawkins, Edward O. Wilson, Kevin Padian, Eugene C. Scott, Steven Pinker, Daniel Dennett, Michael Ruse, Frans de Waal, Noretta Koertge, George C. Williams, George Levine, Stephen Jay Gould, Gillian Beer, Ernst Mayr, and many others illuminates this exciting intellectual history. A wide-ranging new introduction by the editor provides context and coherence to this rich body of engaging material, much of which will be shaping human thought well into the new century. A Selected Bibliography and an Index are included. I. Extract from an unpublished Work on Species, by C. Darwin, Esq.